So you finally bought that sweet cafe racer and now you need gear that looks like a retro-chic thrift-store find, but you don't want to lose a foot when you drop the bike on it. Enter Rokker, known the world over for their high-quality vintage-inspired motorcycle gear. The Rokker Classic Racer Boots are handmade in Portugal with vintage greased cowhide leather that gives them a hard-worn, aged look and also helps the leather repel water and other unwanted liquids. A shock-absorbing insole, heavy-duty rubber outsole, as well as ankle, heel and toe protection mean that you're not just getting a great looking pair of boots; you're getting a great looking pair of motorcycle boots. Gone are the days of having to sacrifice protection for style. 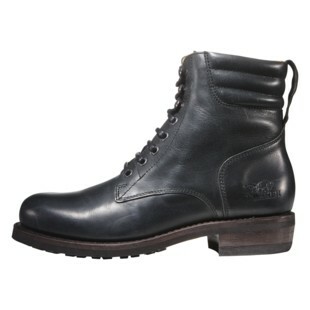 Those days are best left as inspiration for the future, as Rokker has done with Classic Racer Boots.